Lunch options in D.R. 's Boca de Yuma, about an hour away from Punta Cana. The easternmost point of the Dominican Republic is locked in a struggle between the lapping transparent waters of the Caribbean and the darker rough waters of the Atlantic. Throw in the mouth of a freshwater river, and you have Boca de Yuma. By car, this small puebla is an hour away from the 24-hour parties of the all-inclusive resorts of Punta Cana and about the same in the opposite direction of the capital city of Santa Domingo. But its differences set it a world apart. Idle fishing boats at Boca de Yuma. Coming to the end of the road, you quickly realize that you’ve entered a town where fishing is still king. A small cove overcrowded with working fishing crafts basks in the sun. As you scan the horizon you see there may be as many boats at sea as there are ashore. It’s a small glimpse into the rural life of the locals who still rely on the land and sea to provide their living. The streets in the small town are impossibly narrow, but we managed to pass. The main road runs parallel to the ocean and is pockmarked with abandoned businesses and housing in mid-stream construction. Tourism here has either not taken hold or has tried and failed. The sardine-packed buses of tourists we had passed on the motorway were nowhere to be found. Three restaurants sit perched on the cliff overlooking the bay and mouth of the river. We chose one and had lunch. The waiter brought over a large platter overflowing with the daily catch (top). Our choice was difficult; before us was a plethora of fresh seafood. 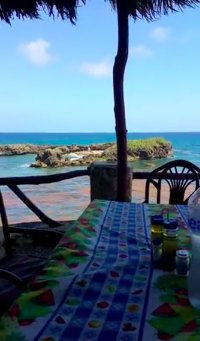 Restaurant view of Boca de Yuma, D.R. With prices at just $5 per pound, we decided upon a grilled red snapper and a couple of the country’s Presidente beers. Total cost for a very filling midday meal for two was under $20. A national park has been established north of town. If you’re willing to risk damage to your rental car, you will be treated to beautiful vistas and an abundance of bird life. Venture in the opposite direction, and you can hire a boat to take you up the freshwater Yuma River. The route to get to Boca is pretty straightforward. Take the modern and maintained Highway 3 and turn west at the well-marked Route 4. Most travel books and sites warn against driving in the Dominican Republic. We didn’t find it difficult – but then again, we didn’t venture into Santa Domingo. Overall the highway system was easy to follow and kept to a high standard. That being said, on our return trip I still managed to miss a turn. Fifteen minutes later, having skirted across a dirt road lined by sugar cane fields, we came across an unofficial but possible access to the main highway. Most come to the D.R. for the resorts. (Full disclosure: we stayed at one as well.) Most are luxurious and offer excellent food, drink and entertainment. Tourism is one of the largest economic drivers of this island nation, and it’s continuing to grow. But if you go, I’d encourage you to venture outside the confines of these “tourist camps” and sample the sights, sounds and tastes of the less-visited Dominican Republic as well.